Giovanni di ser Giovanni Guidi (1406-86) was the younger brother of Masaccio is better known by his nickname 'Lo Scheggia' (the 'Splinter'), because he often worked in wood. He worked on the intarsia cupboards in the Cathedral sacristy and was a specialist in painting wooden wedding chests, or cassoni. 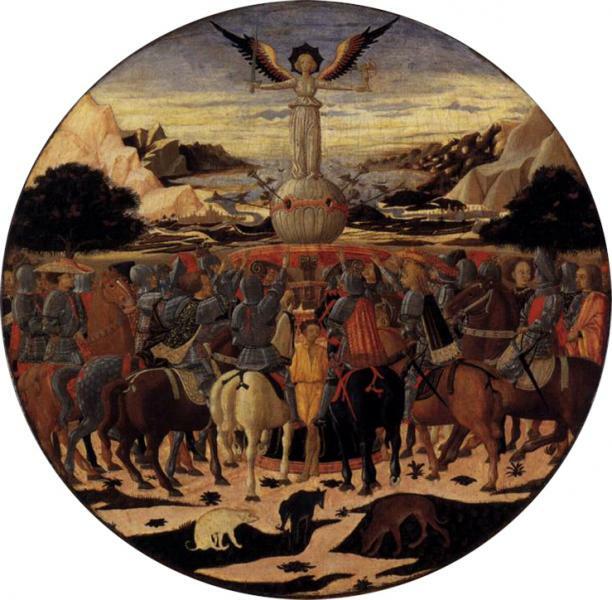 His famous Adimari Cassone, painted with The Triumph of Love in front of the Baptistry is in the Galleria dell’Accademia. He also painted the traditional birth salvers (deschi da parto) given to mothers of noble families who successfully gave birth, including the one above, given by Piero de' Medici to his wife Lucrezia Tornabuoni after the birth of their son Lorenzo in 1449 (now in the Metropolitan Museum in New York). Il Magnifico kept it with until the day he died. Lo Scheggio also painted another rather less serious one in the Palazzo Davanzati.